The UN Security Council remains an important source of legitimacy for international action. Yet despite dramatic changes in the international system over the past forty-five years, the composition of the Security Council has remained unaltered since 1965, and there are many who question how long its legitimacy will last without additional members that reflect twenty-first century realities. There is little agreement, however, as to which countries should accede to the Security Council or even by what formula aspirants should be judged. Reform advocates frequently call for equal representation for various regions of the world, but local competitors like India and Pakistan or Mexico and Brazil are unlikely to reach a compromise solution. Moreover, the UN Charter prescribes that regional parity should be, at most, a secondary issue; the ability to advocate and defend international peace and security should, it says, be the primary concern. The United States has remained largely silent as this debate has intensified over the past decade, choosing to voice general support for expansion without committing to specifics. (President Obama's recent call for India to become a permanent member of the Security Council was a notable exception.) 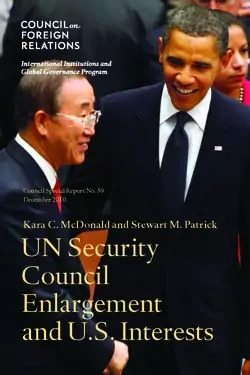 In this Council Special Report, 2009−2010 International Affairs Fellow Kara C. McDonald and Senior Fellow Stewart M. Patrick argue that American reticence is ultimately unwise. Rather than merely observing the discussions on this issue, they believe that the United States should take the lead. To do so, they advocate a criteria-based process that will gauge aspirant countries on a variety of measures, including political stability, the capacity and willingness to act in defense of international security, the ability to negotiate and implement sometimes unpopular agreements, and the institutional wherewithal to participate in a demanding UNSC agenda. They further recommend that this process be initiated and implemented with early and regular input from Congress; detailed advice from relevant Executive agencies as to which countries should be considered and on what basis; careful, private negotiations in aspirant capitals; and the interim use of alternate multilateral forums such as the Group of Twenty (G20) to satisfy countries' immediate demands for broader participation and to produce evidence about their willingness and ability to participate constructively in the international system. The issues facing the world in the twenty-first century—climate change, terrorism, economic development, nonproliferation, and more—will demand a great deal of the multilateral system. The United States will have little to gain from the dilution or rejection of UNSC authority. In UN Security Council Enlargement and U.S. Interests, McDonald and Patrick outline sensible reforms to protect the efficiency and utility of the existing Security Council while expanding it to incorporate new global actors. Given the growing importance of regional powers and the myriad challenges facing the international system, their report provides a strong foundation for future action.